Abu Dhabi is in the process of transforming its economy. Abu Dhabi has large reserves of oil and its economy was primarily based on export of oil and petroleum products. But everything changed after 2014 oil crisis. Abu Dhabi and UAE as a whole decided to change its economy from oil-based to knowledge-based in order to achieve long term benefits. Foreign investment is an important part of this strategy. An important way to attract foreign investment is by providing best business opportunities to foreign entrepreneurs and corporations. An important step taken for this purpose is the construction of more free trade zones. Apart from Dubai, other emirates of UAE were not much focused on these free trade zones in past which is the reason that more than half of these free zones are in Dubai. But now Abu Dhabi and other emirates are also establishing free zones. 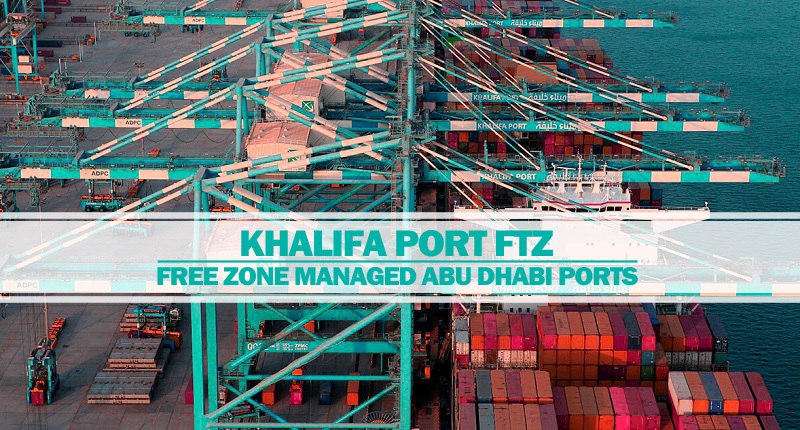 One such free zone that was constructed by Abu Dhabi after adoption of new economic policy is Khalifa Port Free Trade Zone (FTZ). This specific free zone is present inside Khalifa Industrial Zone Abu Dhabi (KIZAD). The industrial zone and Khalifa Port FTZ is administered by Abu Dhabi Ports. KPFTZ covers area of 100 square km. This free trade zone was established in November 2016. The purpose for establishing this free zone in the proximity of Khalifa Port is to attract investors from all parts of world to Abu Dhabi. It is getting popularity with passage of time. An example is $1 billion investment by Chinese companies. The location of Khalifa Port FTZ makes it an ideal place for all types of imports and exports businesses. This free zone is connected to other parts of world through a sophisticated network of road, rail, seaport and airport. Khalifa Port has the capacity to handle largest ships that makes it easier to import large amount of goods in very little time. It is expected that the port will soon be able to offer capacity of 35 million tonnes of cargo every year. Following industries are most suitable to be established in KPFTZ.